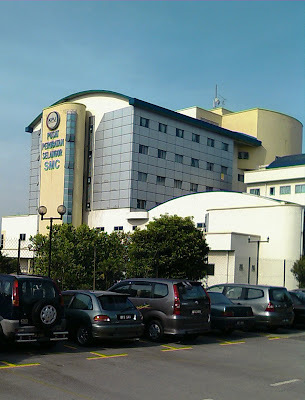 I recently need to travel to Selangor Medical Center, which is a place I do not know how to go. Normally I would have to ask around friends for the direction or search the location maps on the web. However I did not have to that this time as my new Pocket PC has built-in GPS receiver. 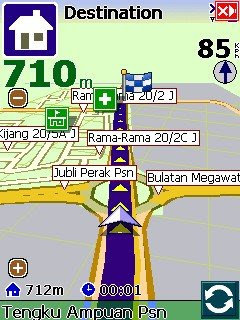 The installed navigation software is MapKing 2007 one of the MapKing series. I just have to search for Selangor Medical Center which is luckily in the database. I select the place and set it as destination. I found a navigation software in my mobile phone very convenient and I foresee every phone will have this features. 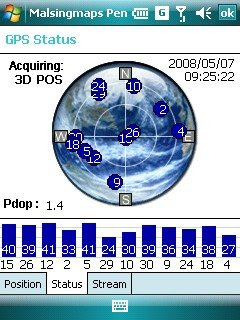 GPS receiver has to receive signals from at least 4 GPS satellites to give 3D position and you can see my GPS receiver has no problem receiving up to 12 satellites which is indicated by the 12 blue bars with the numbers represent the signal strength. More information on GPS can be found in Wikipedia.